Right now, the Cadillac CTS and XTS are the first in line to offer the performance minded VSport models with the CTS VSport (above) recently turning in a time of 8 minutes and 14 seconds on the famed Nürburgring with the help of the a twin turbocharged 3.6L V6 with 420 horsepower and 430lb-ft of torque. 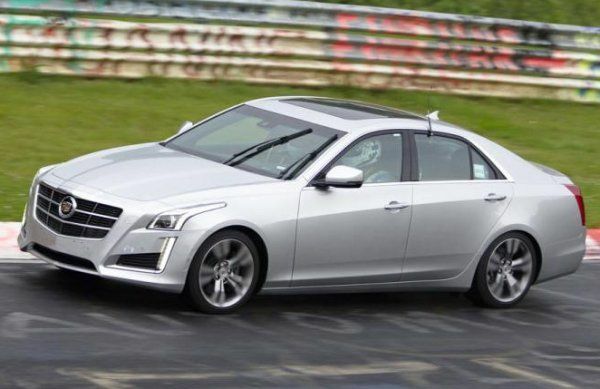 Click here for a look at the CTS VSport on the Ring. The XTS VSport will offer similar higher performance properties with 410 horsepower and 369lb-ft of torque so while it won’t pack the torquey punch of the CTS VSport – the twin turbo XTS should be one heck of a fun premium luxury sedan. When the 2014 Cadillac CTS VSport was introduced, it came as a bit of a surprise as we hadn’t been expecting this new middle child performance model between the standard 2014 CTS and the next generation CTS-V that could arrive within the next year or so. Along with the introduction of the new VSport package for the CTS came the new twin turbocharged version of the 3.6L V6 that has long been in use among Cadillac models and shortly after that came the news that the engine would also make its way into the full sized XTS in a VSport model of its own. So what else could be coming with the VSport nomenclature from Cadillac? The ATS VSport seems like the most logical for those who want improved performance out of the awesome new compact luxury sedan. We also expect to see an ATS-V but we would expect those models to be considerably more expensive than the non-V Series models so as is the case with the CTS VSport – the ATS VSport would offer improved performance without the big price of the ATS-V. The next possibility could be a Cadillac SRX VSport. There is no reason that their top selling compact sport utility vehicle could not see a performance package and with models like the Audi Q5 seeing popularity with the sporty packages among their buyers, we know that there is a market for an affordable performance minded Cadillac SUV. The SRX doesn’t seem like an idea model on which to build a V Series model with 550+ horsepower but a 400 horsepower SRX VSport with the twin turbo V6 and somewhere in the area of 400 horsepower would definitely appeal to those buyers who want a little more performance with some balance of fuel economy and basic price of purchase. Of course, there is also the Cadillac Escalade. The Escalade is unquestionably the ultimate luxury sport utility vehicle but even with a high performance V8 – it is tough to talk about the Escalade being sporty. It is an awesome, opulent vehicle with tons of power but it is also a huge lumbering vehicle that I would struggle to call sporty – even with a new package. So we know that there will soon be a Cadillac CTS VSport and an XTS VSport in dealerships around the country. While the ATS seems like the most likely to get a VSport model, perhaps GM will skip that middle child performance package at first to keep people after the higher performance and higher priced ATS-V but I would still expect to see an ATS VSport in the near future. As for the SRX VSport, that seems like the longest shot but with the push for SUVs that actually offer some sporty qualities – a twin turbocharged SRX wouldn’t be a big surprise either.